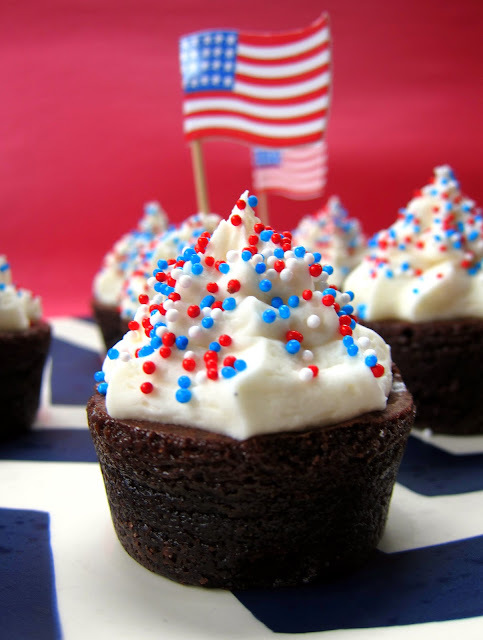 Are you looking for a super simple dessert recipe to take to your 4th of July party? These brownie bites are the perfect treat. I used a box of pre-made brownie bites from Sam's and made some buttercream frosting to go on top. If you want to make these even easier, use a can of pre-made frosting. If you use the pre-made frosting, whip it with a hand-held mixer first. That will make the frosting fluffier and taste more like homemade. I topped the brownies with some red, white and blue sprinkles that I found at Hobby Lobby. Very festive and delicious! In the bowl of an electric mixer fitted with the paddle attachment, cream butter until smooth and creamy, 2 to 3 minutes. With mixer on low speed, add 3 cups sugar, whipping cream, and vanilla; mix until light and fluffy. If necessary, gradually add more powdered sugar to reach desired consistency. Pipe buttercream on top of each mini brownie. Top with sprinkles. Enjoy! I love your chevron tray. Where did you get it? Did you make it? They have blue and orange chevron trays. Thanks kansasgirl1! I fixed it. Jack was not interested in the brownie bites. He prefers pigs in a blanket or egg white omelets! Great idea, so easy!! Love the cat! Cute and easy and right up my alley! Happy Fourth! And Happy Fourth to all your kitties, too!